We've spent some time at Tech Age Kids looking at laptops to help children move from only using a tablet to learning how to use a laptop. In this post, we share our findings and experience with the Dell Inspiron 11 to help you make the right choice for your child and family. Disclaimer: I've purchased the Dell Inspiron 11 for my 6-year-old and he uses it regularly. It hasn't replaced his tablet, but it offers him an opportunity to engage in activities we couldn't on a tablet. Most parents would comment that their young children are pretty nifty at using technology. They know how to find their way around a tablet, purposefully swiping and tapping to play their games or watch on-demand TV. Some even know how to operate their parent's mobile phone. But I also hear teachers comment on how children lack the right skills to use computers at school. Generally, schools have laptops or desktop computers, with a keyboard and mouse/trackpad and there is not a touchscreen in sight. Some schools do have tablets but kids still need to know how to operate a computer with applications. Have you ever used your laptop or computer with a young child that knows how to use a tablet? They always try to touch the screen. Nowadays touchscreen laptops are readily available, but they tend to be more expensive than a standard laptop and not the type of machine I would feel comfortable for a young child to use. 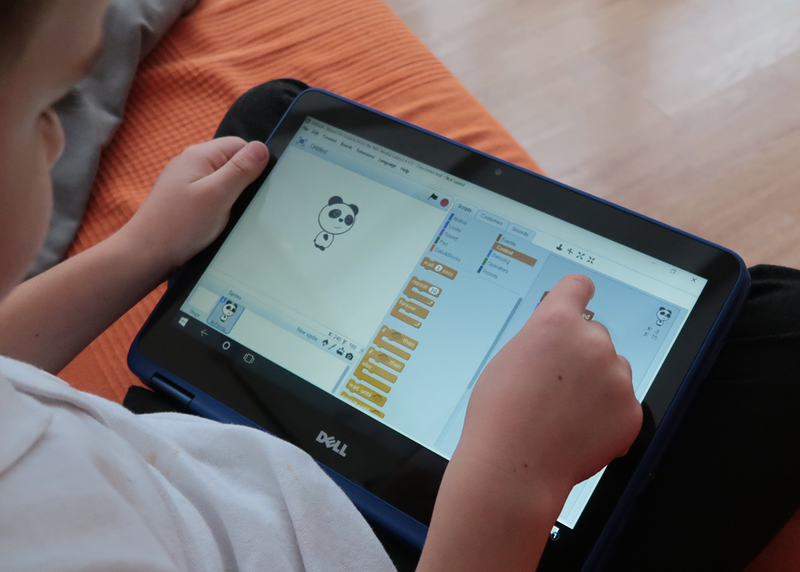 I wanted my 6-year-old this year to start to use a 'proper' computer, to learn new skills and get access to application and functionality not available on a tablet. We came across the Dell Inspiron 11, an 11.6" HD touch display with Windows 10. My son has been using this laptop since the summer and we've been really impressed with its ease of use, responsiveness, and robustness. It's not perfect but it's at a price you may feel comfortable to upgrade in a few years as your child's needs change. The Dell Inspiron 11 is a bright little laptop (we got blue, but there's also red, grey and white) with a touchscreen, trackpad, built-in webcam and microphone as well as Bluetooth connectivity (really important for some coding and robotic kits). It has a Micro SD media card reader for extra storage or to easily download photos from a camera SD card. It also has an HDMI port to connect to a bigger screen. 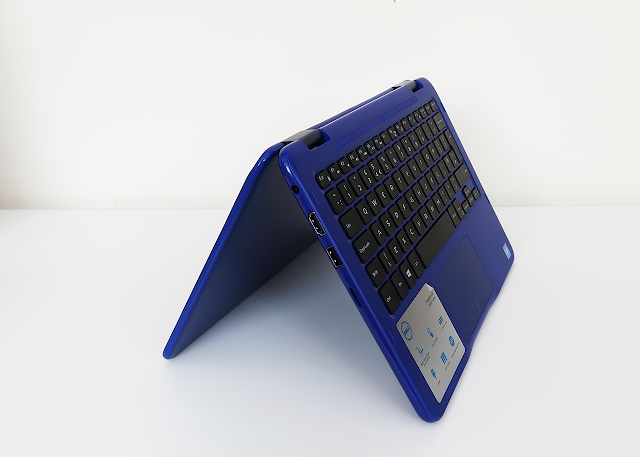 It comes with Windows 10 operating system and the screen is hinged to toggle between laptop and tablet mode. There are a few different options such as the RAM size (2G / 4G) and hard drive size (32GB / 500GB) which affect the price. My son has the 2G, 32GB Dell Inspiron 11 and so far it's worked great for him. Apart from being a good price, what makes this laptop a good choice for a young child? Below are some points we've considered. I love the fact that it is touchscreen. It’s great to help kids transition to using a keyboard if they still have the option to touch the screen. I’ve found that my son uses the touchscreen, trackpad and keyboard interchangeably. The touchscreen helps to lighten the frustration of navigation whilst the child is mastering the skill of using a trackpad and keyboard. I also like the fact that you can flip between using the laptop as a computer or a tablet. The screen flips back and then it automatically goes into tablet mode. The keyboard becomes inactive and then you operate the computer using the touchscreen which includes a digital keyboard like on a tablet. It's a nice screen size for a tablet and comfortable for a child to have on their lap. The hinges seem robust and I don’t feel like they will snap easily with rougher use by younger kids. Many (more expensive) 2-in-1 laptops have flimsy hinges, so this is important to note when buying one for a child. 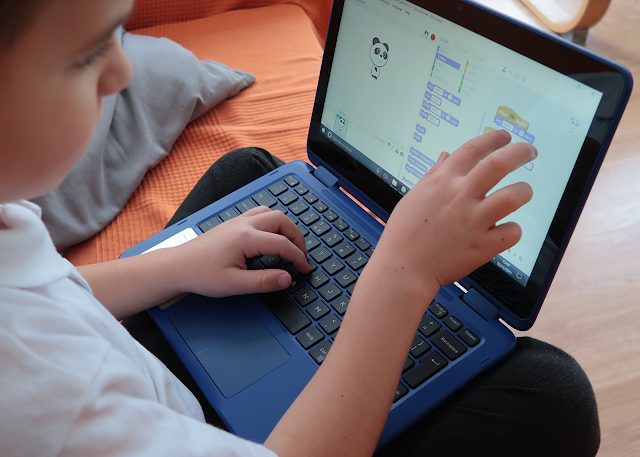 It's worth noting that transitioning from a tablet only device to this laptop, doesn't necessarily mean your child will have access to all their favourite apps. At first, this was a frustration for my son. He wanted everything on one device. Unfortunately, it doesn't work like that. If, for example, your child used an Amazon Fire tablet, their apps may not be available in the Microsoft App store. The Dell Inspiron has a Windows 10 operating system, so its ecosystem is Microsoft. I actually encouraged my son to explore different things on the laptop and steered his attention away from apps, so it became less of an issue. Soon typing games, browser-based applications, and game applications, like Scratch and Minecraft, became more popular. He still chooses to play his favourite apps on a separate tablet. The size of the laptop is really important for this age. You don’t want a laptop that is too big and bulky and prevents a child from using it independently. 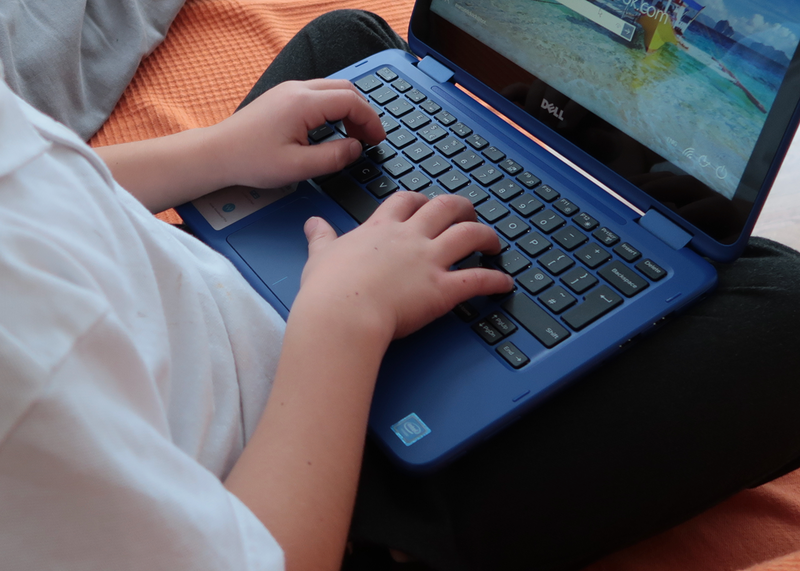 The Dell Inspiron is a perfect size for young children with their smaller hands. The screen is not too small. The keys on the keyboard feel well spaced for small hands to type easily. It’s light and easy to move around. My son would often sit on the sofa with the laptop on his lap and it fits nicely. When he was using my large laptop, he had to sit at a desk, as it was too big and heavy for his lap. This also helps them use the computer more independently and can easily switch between laptop and tablet mode themselves. Most laptops come with a trackpad. They all work slightly differently, but one thing we’ve noticed is that children find them tricky to use at first. They soon enough learn the skill, but you may need to be patient to allow them to work more slowly and practice the skills. I found the Dell Inspiron trackpad easy to use and fairly standard as far as trackpads go. Learning to use a trackpad and mouse, as well as learning to type, was one of the reasons I wanted my son to transition from a tablet to a laptop computer. These are really important skills for school and general life in our modern world. Whether you are buying this laptop as a gift or just so your child has access to a ‘proper’ computer, there is a bit of setting up to do. Firstly the Dell Inspiron comes with Windows 10, and it will force you into what seems like endless loops of updates. Our only advice is to be patient and allow the computer to run its course. If your child is very interested let them watch, but even my son got bored of watching several restarts! If you don't use the laptop regularly, you may find every time you switch it on, it requires an update. It becomes less of an issue if you and your child recognise this process as part of using the laptop and build in time for a potential Windows update. Secondly, most new laptops will come with a load of software, apps and trial products that you just don’t need or want a young child to have access too. I deleted all age-inappropriate games and decided which programs I wanted my son to use, installed those and then uninstall all the rest. It’s a good idea to set up a Microsoft account for you as a parent to manage a child account. Make your Microsoft account the admin user and create a child Microsoft account for your child/ren. This way you can track what your child does and how much time they spend on their laptop. Because it’s Microsoft, your default browser would be Microsoft Edge. I prefer Google Chrome and use the supervised browser for my kids. We also set up Google Safe Search to help prevent kids finding nasties on the internet unexpectedly. The Dell Inspiron 11 does have limited storage but you have the option to increase storage with an SD card. This does limit the number of programs you can download on the laptop. There are a few things you can do. Delete temporary files, duplicate photos and file history versions. Delete previous installations of Windows and uninstall applications you don't need. You could also use cloud storage for their documents and files or use a portable USB drive. Different versions of the Dell Inspiron also have different storage options which affect the cost of the laptop. 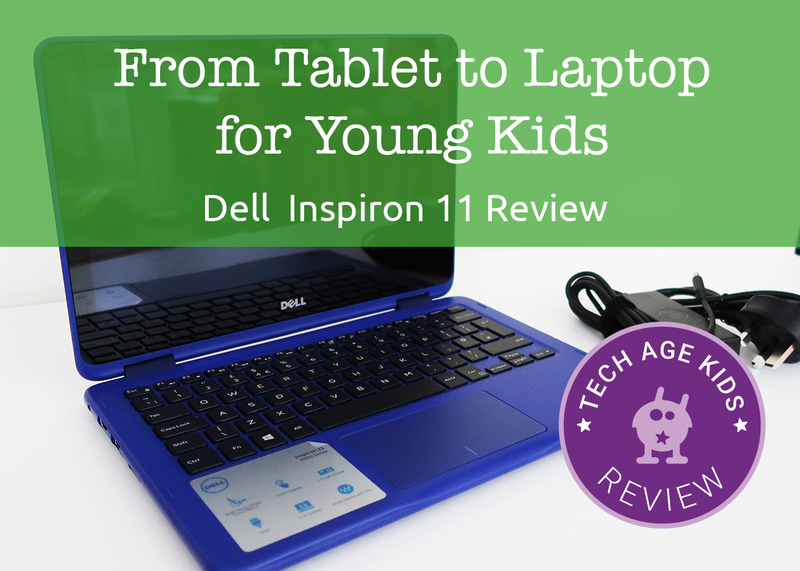 The Dell Inspiron 11 is a great little versatile laptop as a first computer for kids. The touchscreen is a great way to help ease the frustration of using a trackpad and keyboard. The laptop has coped with a lot of different things applications (just not all at the same time). It wouldn't be a good choice for a gamer. See our post about getting a first gaming computer for a child. We've managed to play Windows Edition Minecraft, program Scratch, connect a Bluetooth Robot to program, send 3D models to our 3D printer using the Microsoft 3D Builder app. Our biggest frustration is the location of the power button (it's on the right-hand side) which means you can accidentally switch off the computer, when you pick it up or move it when it's in laptop mode. It is slower than my Macbook Pro, but then it's not nearly in the same price bracket. You'll get a reliable little laptop that's kid-size, and looks fun for children which you can then upgrade as their needs change. My middle son, has the big brother version of the Dell Inspiron 11 which we'll cover in another post. If you're not particularly after a laptop with a touchscreen, the HP Stream is another great option for young kids. HP also have a touchscreen version with a very similar spec as the Dell Inspiron 11, but they have purple available!